2 MB External SRAM located at IC13. Note: If jumpers J10, J11 and J12 are configured for ETM Trace, only 1 MB of this SRAM is accessible. 8 MB External NOR Flash located at IC16. Note: If jumpers J10, J11 and J12 are configured for ETM Trace, only 1 MB of this Flash is accessible. 512 MB External NAND Flash located at IC14 (on the back side of the board). 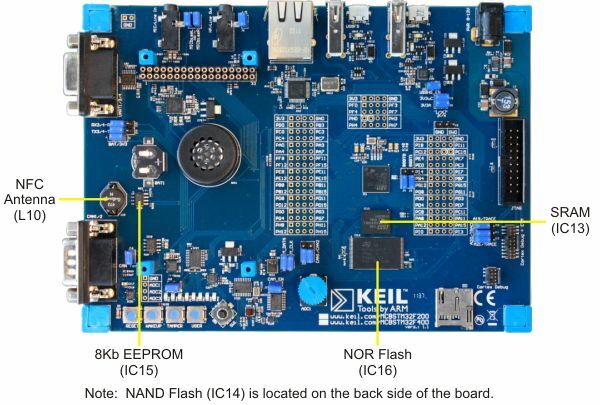 8 KB EEPROM with NFC (wireless near field communication) interface located at IC15. The NFC antenna is located at L10. The table below identifies the chip select, pin and address area for the external memory and LCD devices on the MCBSTM32F200 board. NAND-Flash FSMC_NCE3 / PG9 Not directly mapped to a memory area.